Although I am not playing mas next year ... Trinidad Carnival is very much in the back of mind. I will miss you TRIBE! So here are some last minute websites to make your last minute planning alot easier. 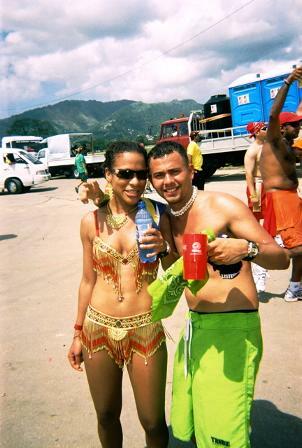 No matter, when you decide to play mas, visit Trinidad Carnival Diary. Read Saucy Trini's Disclaimer: This blog is not intended to influence anyone to play with any one Carnival band over the other. This is a place to come and get a little carnival info (how ah buy it is how ah selling it), look at some costume pics, "listen" to me talk about mas and occasionally vent or speak my mind. Keep the comments clean, no insults as this despot will exercise the moderator privileges. Use with caution! If you are still interested in Trinidad Carnival 2008, visit Carnival Junction.com. Your #1 source for carnival classifieds. It has now mostly become an auction site where costumes are being sold to the highest bidder. Last minute, desperate masqueraders are no longer paying mas camp prices for a costume but exorbitant prices instead! ... Maybe there's a costume for you!